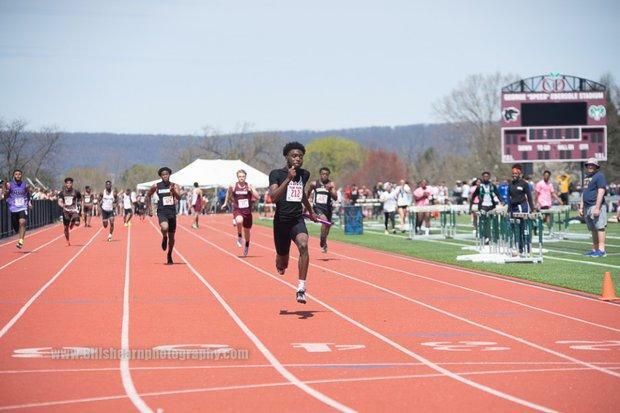 HARRISBURG, Pennsylvania -- A certain hush fell over the crowd at Landis Field in Harrisburg on Saturday as Shawn Brown powered down the home stretch of the boys 4x100 meter relay. The field -- a strong one at that -- had been left in the dust by Brown, who was anchoring his Central Dauphin East squad to a convincing relay win at the Pan-Ram Invitational. That "hush" was the onlookers knowing it had witnessed something rather special, and it was still trying to figure out its reaction. After crossing the finish line, Brown turned around, shook a few hands of his competitors, and went over to greet some teammates, who had the live results already on their phones. That time wasn't quite the time the Panthers had in mind. That was 41.14, the all-time Pennsylvania state record in the event. But it was still one to make the state of PA -- and the nation -- take notice on what just occurred. "We've been planning for this all week," Brown said "We just had to execute, but we came a bit shy." It was a historic day for the CD East squad, one that will surely set the stage for an exciting final month and a half of the season. Pan-Ram is a good midseason benchmark meet for a number of Central PA teams. With some surprisingly nice weather for this time of year, it was a great day to eat and CD East served up the day's main course. CD East's 41.17 put the squad at Pennsylvania No. 3 all-time. With still a month and a half before the PIAA State Championships, only Harrisburg's 41.14 from 1998 (also the PIAA meet record) and Gateway's 41.16 from 2014 stands in the way of the Panthers. Those times, however, came at the state meet in late May. Just .03 off the record, East will have plenty more cracks at the all-time state best. After a 41.55 at the Tim Cook Invitational at Chambersburg to open up the season -- one of the fastest pre-April times ever by a PA team -- the stage was set for this team. It was that race, Shawn Brown said, that gave East the confidence to go even faster at Pan-Ram. Bryce Baker started the relay off well. The junior emerged during the indoor season, and has carried that momentum into the outdoor campaign (he was sixth in the 100 final in a PR of 11.03). Baker made up some of the stagger of East's District 3 rival Harrisburg on his outside. Next up was David Niang. Niang hung well with Harrisburg's second leg. It was on the third leg, where the race blew itself open. Niang and Stephon Brown executed a picture perfect exchange, and the elder Brown brother gained some serious separation on the field. He handed off to his younger brother Shawn, who had already posted the state's fastest invitational 100 meter time of the season earlier in the day. There was no doubt about place at that point. "It's a blessing," Stephon Brown said. "It shows that we can run the best times in Pennsylvania as a whole. Next time we go out here, we're going to do what we have to do, so we can finish the job off. Next up for the East 4x1 will be the Penn Relays, where it could certainly make some noise on an even bigger stage. Then the calendar flips to May. We'll see more and more days like the warm conditions that Saturday brought. And there will be more chances to break that record. And then there's the 41 second barrier, too. 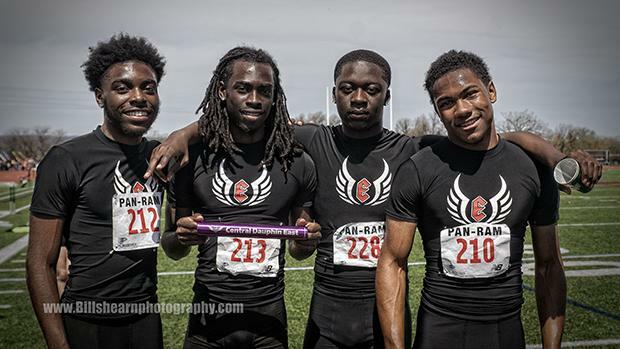 It wasn't just the 4x1 that was making noise for CD East at Pan-Ram. The Panthers put on a show all day long. In the 100 meters, Shawn Brown won what turned into the day's most exciting race, edging out Harrisburg's Kamere Day at the line for the win. Brown got out well, but Day, who closes well, narrowed the gap forcing a photo finish that took a little while for the timers to sort out. Brown's lean, that turned into a dramatic somersault at the end, proved to be the difference maker. Both boys clocked a 10.54, a time that Pennsylvania isn't used to seeing this early in the season. It puts both Brown and Day at PA#2. It's not the last those two D3 sprinters have seen of each other this spring. In the 110 meter hurdles, Emmanuel "Manny" Niang posted the state's fastest time with a strong win. Niang went 14.29, a major PR for the win and new PA#1. Last year, Niang didn't break 15 seconds in the high hurdles, but he's roared into this season. He was third in the 60 meter hurdles at indoor states and he's kept rolling into outdoors. Stephon Brown put an exclamation point on the day for East. After the 4x1, Brown was set for the 400 meters. After keeping pace with the stagger through 150 meters, he turned on the jets. Just as he accelerated on the back turn in the 4x1, Brown threw down a monster third 100 and came home for the win in 48.12, a PA#2. He's just one of two boys in PA that have broken 49 seconds in the 400 this spring. Saturday was a statement meet for Central Dauphin East. It's not the last we've seen of them this season.